One thing I learnt from our good friend Pam, as well as my artistic brother is to keep my eyes open when I am out and about. You never know what inspirational treasures are out there, just waiting to be found. My brother is particularly interested in street art and shared some of his Viennese faves when we were in the city last week. And I know that Pam loves to find a street art wall and get her photo taken there. So when I was standing at a train platform, having missed my connection and having a few minutes to kill, I was interested to see that this graffiti really caught my eye. There's a lot of tagging, street art and graffiti in Germany, some of it good, a lot of it not so. (And please understand that I'm not condoning graffiti - it is, after all, vandalism of property) But even I find myself admiring some of the more artistic creations and this one falls into that category. So this week, I'd like you to be inspired by this graffiti. I love the colours combined here - the blues, aquas, even the orange and green outline. I love the letter style and the spotty pattern here and there. 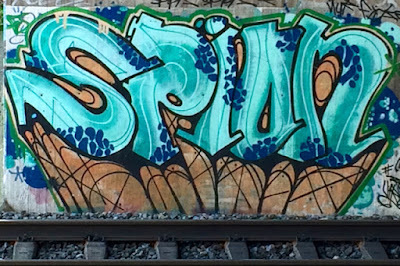 I like to think about the meaning behind the word "Spiun" - it says nothing to me per se but is clearly something very important to the "artist" who created it. Or is it "Spion" which means "spy" in German? Perhaps it will inspire me to talk about my new found attention to street art and how my brother now IGs me when he's found a new one in Vienna to add to his collection. Will it be the colours, the design or the topic that inspires you this week? As always, it's wonderful when you share your creations over at the Whimsical Musings Flickr gallery and don't forget to tag it WM#175.